I’ve been a mom for almost 8 years now so I feel like I can consider myself a seasoned birthday party planner. I’ve done big parties and small parties. Parties at home and parties at a rented space. Parties that were budget friendly, and parties that were definitely not. My son is turning 3 and we had his birthday party this past weekend. 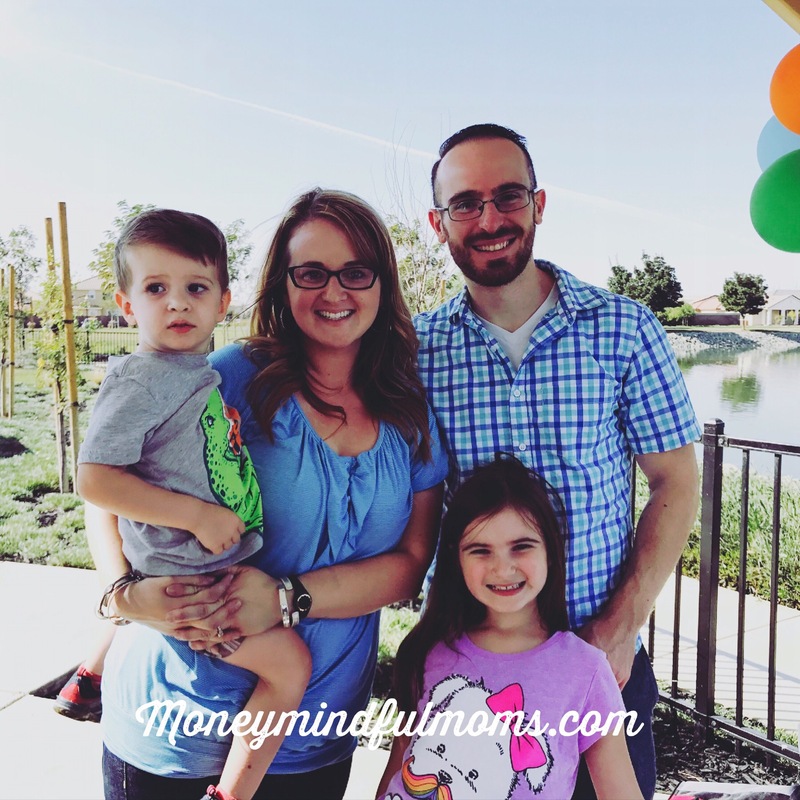 I looked into some options of doing his party at a big party place and as I added everything up in my head I just knew we needed to figure out another way to celebrate because it was just going to cost too much. So I thought about what he loves, I mean this day is supposed to be about him right? And if there’s anything in this world that kid loves it’s dinosaurs. It’s safe to say about 50% of the words that come out of his mouth are dinosaur related. 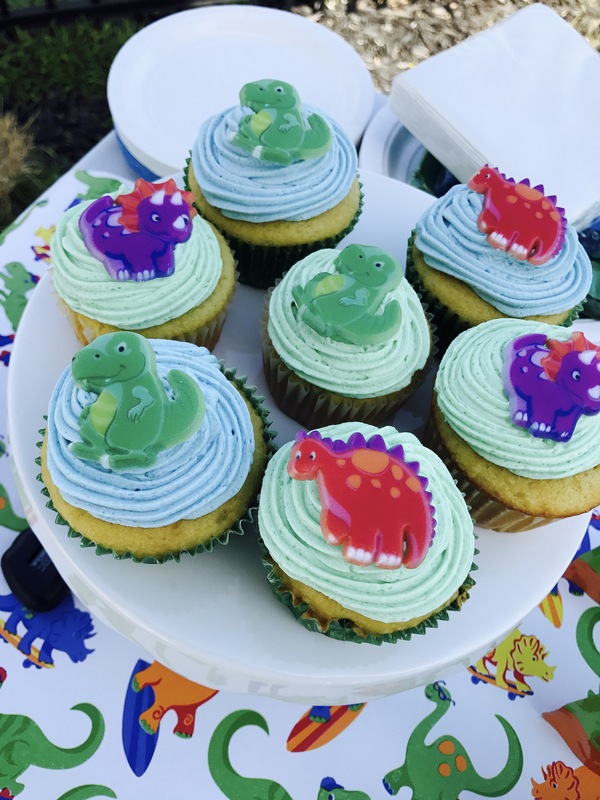 So I was on a mission to figure out how to have a dinosaur party on the cheap. And now that it’s done I can say we succeeded! And although a lot of this is specific to our party theme, you can take many of these ideas and tips and transfer them to any theme. 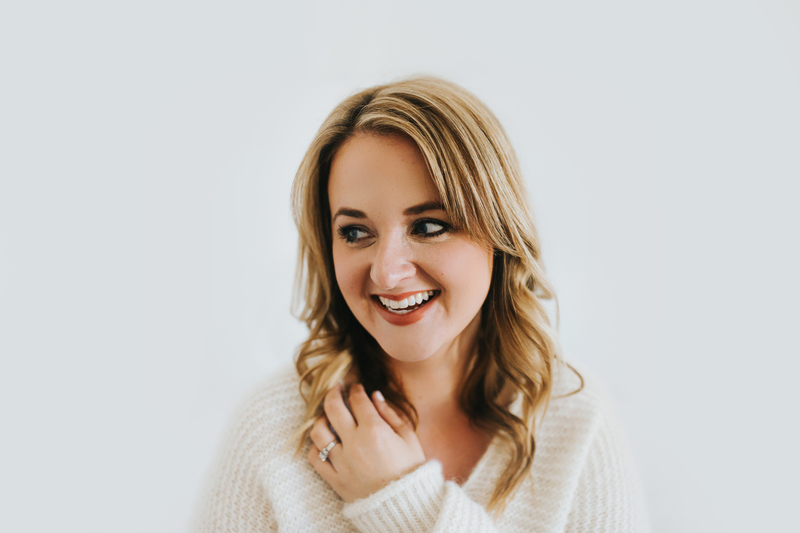 I realize it’s a lot easier to have the party at a party place but you’re paying for convenience so if you’re on a budget you may want to consider having a party at your home. If that’s not something you’re willing to do, do you have a family member that loves you bunches and would be willing to host? We ended up doing ours at the playground down the street from our house. Most of the guests were neighbors anyways so everyone just walked down the street. It was free AND I didn’t have to clean my house! Winning! I think this is the part I really cut the budget down on a ton. One thing I do for every party is use a roll of plastic white table cloth, cut it to size for each table, and then cut a strip of wrapping paper with a pattern that matches the theme for a table runner. You can get this big roll of white plastic table cloth from Hobby Lobby for $9 when you use a 40% off coupon. Plus it lasts FOREVER so you’ll get your money’s worth with it. Then you can pick up a roll or 2 of wrapping paper with a pattern that matches the theme you’re going for from the Dollar Tree and your tables are done! This year our wrapping paper runners looked brand new when we were done with the party so I rolled them up and took them home and will probably use them to wrap my son’s birthday gifts! 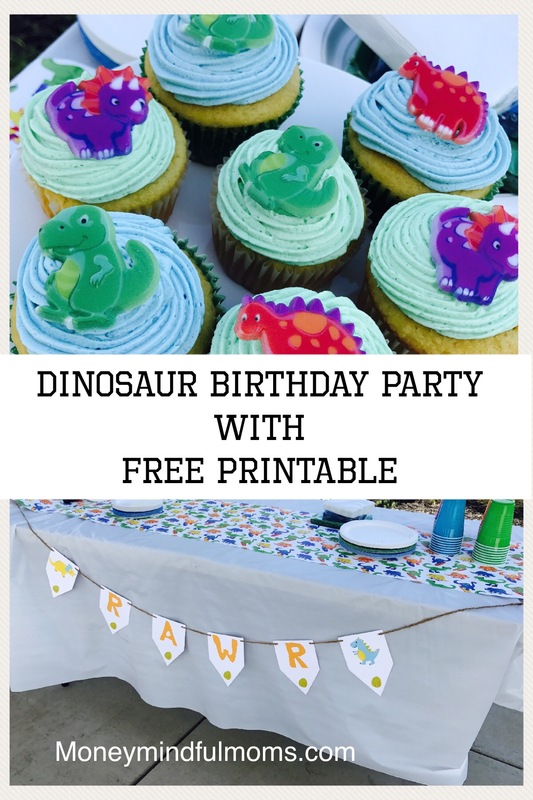 Themed party decorations and plates can be pricey so getting the solid color balloons, streamers, plates, cups, etc from the Dollar Tree and then finding other ways to tie in your theme can save you money. 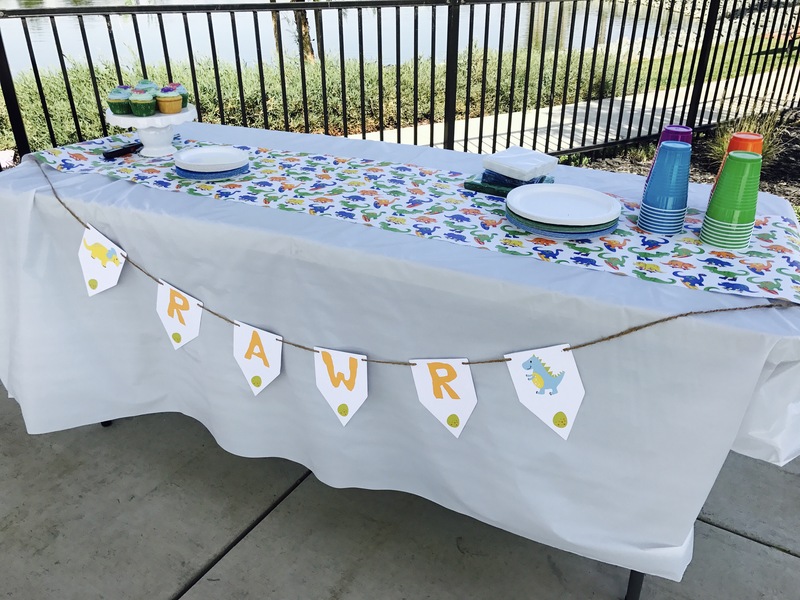 We made our own banner to match the dinosaur wrapping paper we used for our table runners. You can find that HERE if you want to download it and use it yourself! We wanted to make sure we had more than enough food for kids and adults so we had a few things to snack on before pizza and cupcakes. I asked my dad to bring his famous dip and chips and he was happy to oblige. If you have family or close friends coming that are famous for something don’t be afraid to ask if they’d be willing to bring it. We also grabbed some applesauce pouches and a trail mix for easy snacks. We threw around a few different ideas for what to do for food but we kept coming back to pizza as being the easiest thing since we weren’t going to be at our house and Costco has a great deal on take and bake pizzas. We baked them at our house right before and then carried them down to the park with us. I also came to the conclusion I needed to make the cupcakes if I wanted to stay on budget. Having a cake made by someone else can be pricey, and rightly so as it takes them a lot of time to make those beautiful pinterest worthy cakes. Instead I bought yellow cake mix and made cupcakes. I made homemade buttercream frosting to make it taste a little more homemade and then I got these dinosaur rings for the top. Hardly pinterest worthy but they tasted great and were a fraction of a fraction of the cost. Party favors are one of those things you feel like you have to do but you know the cheap plastic trinkets are going straight in the garbage when the kids get home. So we decided to have the party favors be part of the entertainment for the kids while they were there. 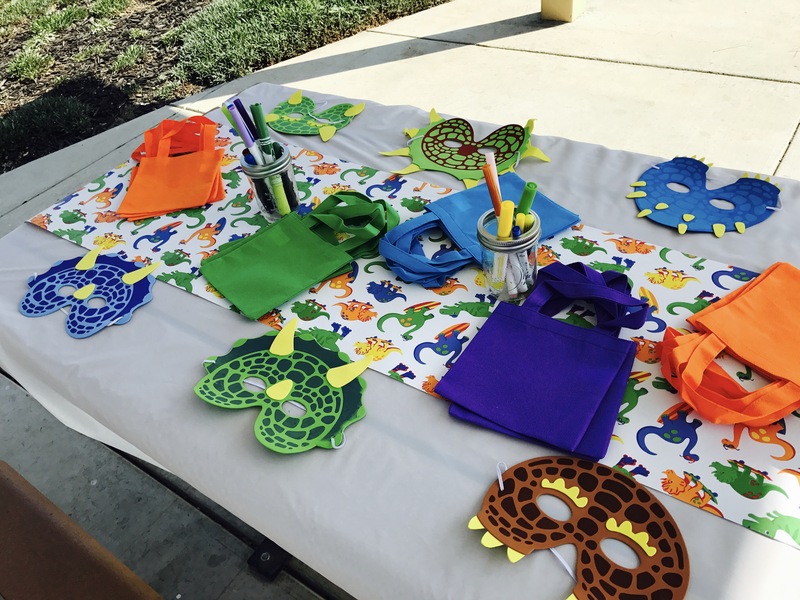 We had a table set up with canvas goodie bags I got from The Dollar Tree and markers so they could decorate their bags with their names. They could put their dinosaur masks in their goodie bag to take home or wear them at the party. Then we had dinosaur figurines and dinosaur eggs we hid around the playground and let the kids go find them and put them in their goodie bag. 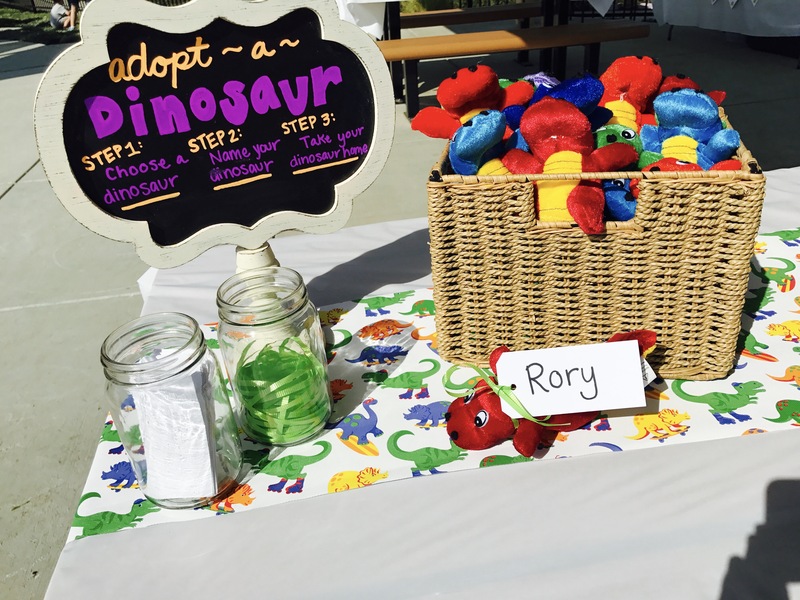 We also had an “adopt a dinosaur” station where they could pick a plush dinosaur, and make a name tag for it. Just these few activities kept the kids pretty busy before the food but if they finished early or weren’t into it the playground was right there so they had something else to do. Not bad for 12 kids and a bunch of adults!